AKIPRESS.COM - Bahrain and Turkmenistan signed agreements on March 18 to strengthen bilateral cooperation. Turkmen President Gurbanguly Berdimuhamedov received King Hamad at the presidential palace in Ashgabat. 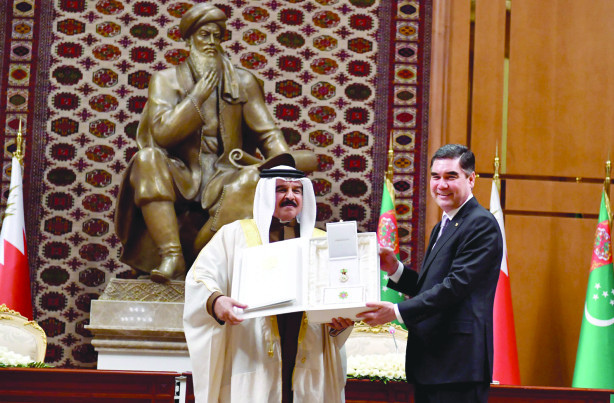 At the end of the negotiations in an expanded format, the ceremony of signing bilateral documents took place in the presence of the President of Turkmenistan and the King of Bahrain. Turkmenistan and Bahrain signed the Memorandum of Understanding on the development of transport cooperation; the Memorandum of Understanding on cooperation in the field of e-government between the Government of Turkmenistan and the Government of the Kingdom of Bahrain; the Memorandum of Understanding between the Central Bank of Turkmenistan and the Central Bank of Bahrai; the Memorandum of Understanding on cooperation in the sphere of culture between the Government of Turkmenistan and the Government of the Kingdom of Bahrain; the Memorandum on cooperation in the field of education between the Ministry of Education of Turkmenistan and the Ministry of Education of the Kingdom of Bahrain; the Memorandum on cooperation in the sphere of sports between the Ministry of Sports and Youth Affairs of Turkmenistan and the Ministry of Youth and Sports of the Kingdom of Bahrain; the Memorandum of Understanding on cooperation in the sphere of tourism between the Government of Turkmenistan and the Government of the Kingdom of Bahrain are aimed at intensifying cooperation in the humanitarian sphere. The Agreement between the Government of Turkmenistan and the Government of the Kingdom of Bahrain on mutual visa-free regime for holders of diplomatic, official and special passports and the Memorandum of Understanding on Women’s Affairs between the Government of Turkmenistan and the Government of the Kingdom of Bahrain were also signed. Additionally, King of Bahrain Hamad was awarded the order of neutrality. King Hamad also visited Kipchak to pay tribute to the memory of the first President of Turkmenistan laying flowers on the mausoleum and visiting the Turkmenbashi Spiritual Mosque. Then the cortege of the King of Bahrain traveled to the Monument of Independence of Turkmenistan, where the distinguished guest laid flowers and planted a tree in the Alley of Honored Guests.